When Mr. Official (aka Yahia Jaber) started in the barbering business, he worked so hard that sometimes he even slept in the shop. That hard work paid off. 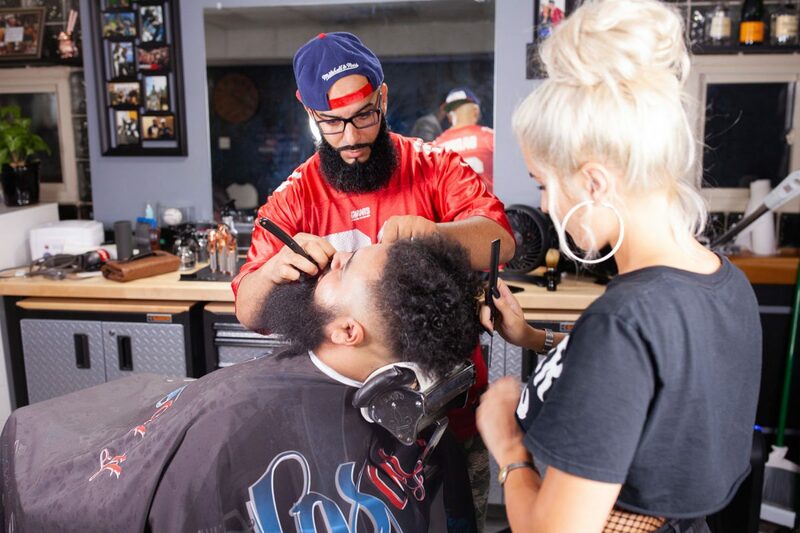 Today, Mr. Official is the founder and owner of Official Cuts, a chain of four influential barbershops in the Chicago area. He’s also widely known as one of the best beard specialists on the planet. His journey from being a behind-the-chair grinder to a successful entrepreneur wasn’t always easy. But his passion for the fundamentals of barbering helped him to succeed. Of course, making smart business decisions helped, too. We met with Mr. Official to talk about what it takes to get the next level. Learn how Mr. Official uses Booksy to deliver better service—and make more money. What kinds of opportunities do you see now in the barbering business? The barbering business is very vast. Especially now, you have so many different areas. You have the old-school barber, the behind-the-chair grinder, the shop owner, the entrepreneur that’s getting into products, people that want to open up schools, clothing lines…I mean there is so much that you can do. You just have to pinpoint what it is that you want to get into. 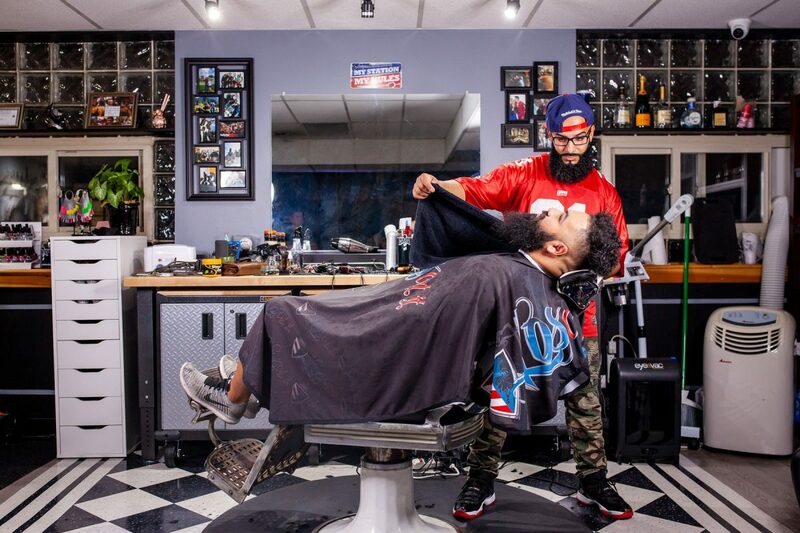 There are opportunities for barbers beyond haircutting. Mr. Official has grown his brand to include manufacturing, education, and more. What’s the most important thing you need to succeed as a barber? The fundamental barber has to have a hard work ethic. There really is no shortcut. It takes old-school hard work, just like anything else you want to be successful at. Also, save your money and be very cautious with your spending. You don’t want to get cocky and be like, “I’m booked all day, I’m going to go get this outfit and these shoes and this car and do all this…” You don’t want to do that. Stack your money. Clients come from all over the world to get with Mr. Official. This man came in for a fade, beard enhancement, and braids. Aside from just raising your prices, what can you do to get to the next level? Opening your own shop is the logical next step up. See how much rent goes for in your area and how much it would cost to open up a shop. Once you’ve done that and you’ve developed a channel of income, you’ve developed something that will make you money without having to work. 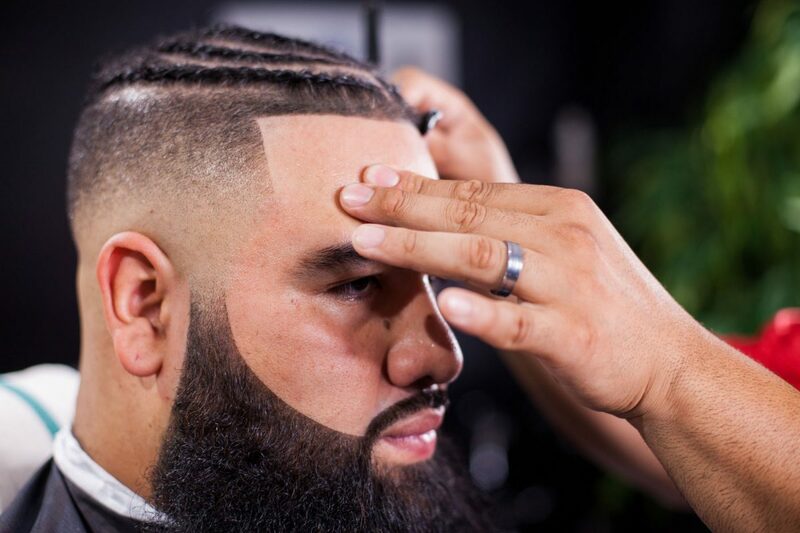 Ready to Take Your Barbering Game to the Next Level? What’s your best advice for someone opening their own shop? If you can, buy the building. Because once you buy the building, now you’re a landlord and nobody can force you out of your business. Once you pay it off, the money that you were paying in rent is now income. It’s the greatest thing I’ve done because now I have an asset. Mr. Official may be successful, but he doesn’t do it on his own. 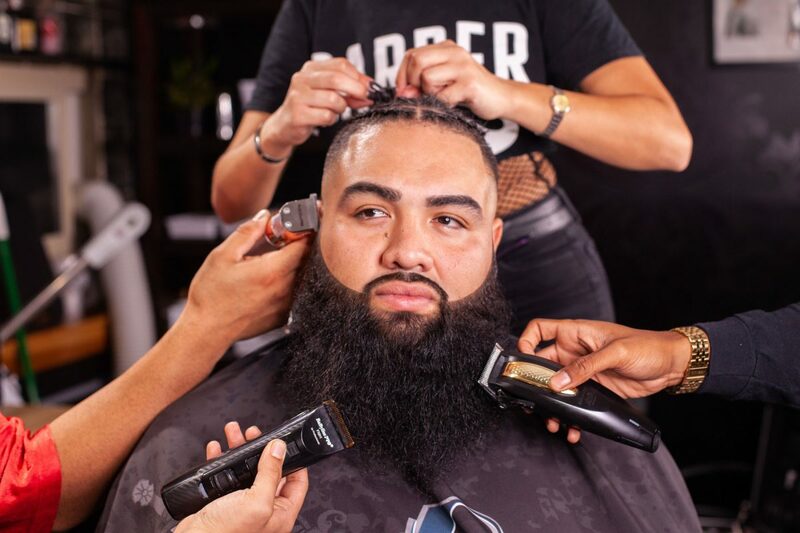 His #TeamOfficial crew (including Assyria Gindo, pictured here) are all skilled barbers who share his commitment to the craft. How has Booksy helped your business? Booksy is a game changer. 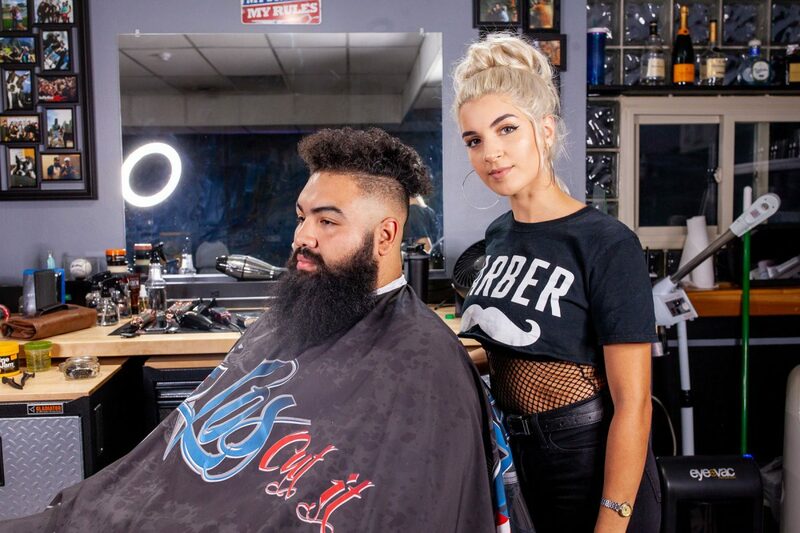 I’ve been doing this for 15 years and the thing with Booksy is, if you’re a barber and you do it on a regular basis and you’re in the shop 10,12, 8 hours a day, you don’t realize how much time you’re losing communicating with your clients while working on them. I would be cutting a client’s hair and conversing with them. Then, I’d get interrupted with a text message from another client and I’d be going back in forth about what time they can come in, etc….Sometimes it could take the whole duration of when I’m working with a client. Booksy handles those communications so I’m not interrupted anymore. While Assyria works the braids, Official crafts the beard. Why is it so important not to get interrupted? Because it’s disrespectful to my client’s time. If you’re on a level where you’re charging a premium for your haircut and for your service, your client doesn’t want to be bothered with whatever else you’ve got going on. You’ve got to devote that time to your client because they paid for that time. Mr. Official’s mastery with a blade lets him carve lines that are razor-sharp. What’s the outcome of dealing with fewer interruptions? It let me raise my premium and just charge for my time instead of just trying to cram as many people in as I can. Now, I just book everybody for an equal amount of time. If it only takes me 15 minutes to cut your hair instead of 30, instead of rushing you out I can offer you a different service. I can spend more time with the experience, whether it be washing your hair out, applying a facial scrub, or whatever the case may be. Aside from helping you manage your bookings, how else has Booksy helped you? It’s opened my services up to the world. Not locally—the world. My last client came in from Paris, France. He was flying in to Chicago, had business downtown, and found me on Instagram. I have the Booksy book button on my social media and he used it to set his appointment. I have new clients from all walks of life booking me on Booksy all the time. Everyone from blue-collar people to Fortune 500 employees. It’s amazing. You don’t get this level of service at a Supercuts. How do your clients like using Booksy? My clients love it. They just log on, click the book button, and it shows them what days I’m in and what times I have available. With Booksy it’s just the request, confirmation, and done. Quick, simple, and easy. What do you say to other barbers who are skeptical about spending money on a scheduling app? If you’re a professional, be professional. If you’re skeptical about spending $29.99 then you’ve plateaued. What’s $29.99? Spend that money on something that’s going to help you. How do you feel about recommending Booksy to other barbers? I feel like Booksy is not only something I recommend, it’s a must-have. Special thanks to our friend @Los_Cut_It for hosting this session at his private barbering studio in Chicago.